With optimal paces, a clear type, a large frame and an exceptional work attitude, Zenon is a first-class riding horse. In 2017, he came third at his stallion performance test in Adelheidsdorf with high individual marks and 8.66 overall. Zenon’s first foals please with their harmonious conformation and their extraordinary paces. 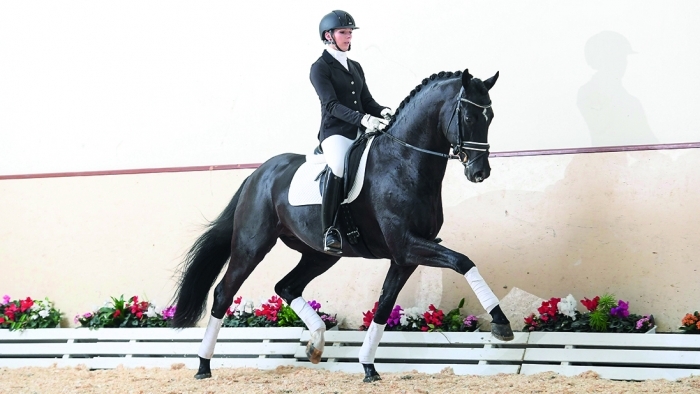 His sire Zonik, who combines the best of Danish breeding with Zack, Romanov and Don Schufro, was placed at the World Championships and started competing at international Grand-Prix level with Edward Gal/NED in 2017. In 2018, he took the eighth place at the World Cup final in Paris/FRA and was placed seventh individually and fifth with the Dutch team at the World Equestrian Games in Tryon/USA. His dam sire Don Schufro, who appears twice in Zenon’s pedigree, won Olympic Team Bronze with Andreas Helgstrand in Hong Kong/HKG. His grand-dam L’actrice VDL is the full sister of the licensed stallion L’Acteur, who was successful up to Inter I.
Zenon is stationed at Deckstation Paul Schockemöhle in Mühlen.